ce cream is perhaps the quintessential summer-time treat. Oh, wait a minute, ice cream is a quintessential treat any time of year. No matter what season you enjoy this ice cold dessert, it will definitely taste better when packed inside of homemade waffle cones. The combination of slightly sweet flavor and a wonderful crispy cookie texture add up to a perfect cone that will beat just about any store-bought variety. When you make your own cones, you can definitely taste the difference. I’ve had my waffle cone maker for many years and it gets plenty of use in my household. Once you start making your own cones, you may not ever go back to the store-bought variety. There are a number of waffle cone makers on the market and you can find the one I use on-line HERE. Most waffle cone makers will include a recipe booklet but I’ll walk you through the one I used for this post. This recipe only requires a few ingredients including 2/3-cup sifted all-purpose flour, 1-egg white and 1-whole egg, 1/2-cup of granulated sugar, 1/4-teaspoon of salt, 1/2-cup of granulated sugar and 2-tablespoons of melted and slightly cooled butter. Beat the egg, egg white and salt with a fork until well blended. Then, add the sugar and mix well. Sift the flour and slowly incorporate it into the egg mixture. Add the melted butter and stir until well blended to create a smooth batter. Lightly spray the waffle cone plates with cooking spray. Drop a few tablespoons of batter onto the center of the heated plate and close the lid. Don’t walk away from the appliance because these waffle cone bakes very quickly. It may take a few tries to get the hang of just how much batter to use to create the perfect cone as you can see from the uneven result below. Now, this one is better. If you find your cones coming up uneven just add a little more batter to the plate the next time around and you should get a more well-rounded result. NOTE: Don’t toss a cone just because it’s not a perfect circle. Even an uneven cone can be rolled into a tasty offering. A plastic cone shaper comes packaged along with this appliance. As soon as the cone is baked, lift it off the plate carefully with a fork and quickly wrap it around the cone shaper. You may need to use a paper towel to protect your fingers while rolling because these cones are super hot as soon as the come off the griddle. Roll quickly because the cone cools quickly and as soon as it cools down it will become too hard to fold without breaking. By the way, you can control the shade of cone you produce. Simply adjust the temperature setting on the appliance and make your cones as light or dark as you like. Once you start making your own waffle cones, you may want to start experimenting with different ingredients. I added dried lavender to one of my batters which not only created a really delightful aroma but also added a subtle hint of lavender flavor. I’ve been making homemade waffle cones for many years and there are so many different ways that this crisp goodie can be served up. For a look at making waffle cone bowls, fruit-filled waffle cones and waffle cone bits be sure to revisit my previous post on waffle cones HERE. Meanwhile, as cute as homemade waffle cones are, they’re even more adorable with a handcrafted waffle cone holder. All you need is some assorted scrapbook paper, a pair of scissors and some glue. NOTE: I’ve created a PDF template for the cone holder and you can download a copy HERE. Cut out the template in my PDF download and use it to trace the shape of the cone holder onto the back of the scrapbook paper. Apply a small amount of glue along the notched edge of the cut out template. You can use the plastic cone to help shape the paper cone holder. Then, adhere the glued edge of the paper to the other side to form a cone shape. Be sure to thoroughly clean off the plastic waffle cone shaper once you’re done making your cone holders. Consider making homemade waffle cones to gift to friends and family. Just package them up in a clear bag, seal with a twist tie and add a pretty bow. 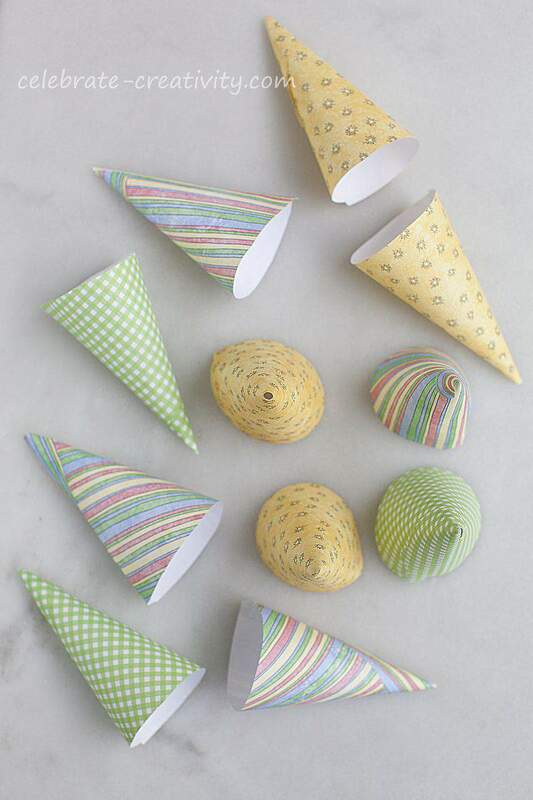 How beautiful those cones look and such a great idea for a fabulous gift!…you take the most wonderful photos!! YOU are the reason I bought my waffle cone maker a few years ago and I love it! Thanks for the reminder to get it out before summer leaves us in the dust!! !